When the end of your lease agreement is approaching, it is a good idea to start looking up reliable end of tenancy cleaning in Ealing. And when the agreement has been unexpectedly broken, it is an urgent necessity. With flexible and convenient services even on short notice, Cleaners in Ealing has helped many tenants get their deposit back and many landlords find new tenants by providing highest quality cleaning standards on a budget. 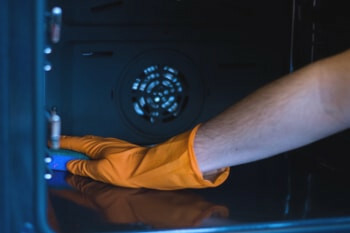 We have a team of certified and trained professionals at your service, ready to land a helping hand with professional equipment and bespoke detergents and share their expertise and experience in the cleaning industry. We’re aimed at achieving brilliant results and meeting move-out report standards but we also have a dedication to keeping our customers and the environment safe, so we use eco-friendly cleaning products and apply COSHH compliant procedures. We will use professional equipment in order to remove stains and spots and make the property sanitised. We will have carpets and soft furniture hoovered and free of dust and odours. We also scrub and wipe hard floors and will dust of the hard surfaces. We do a deep bathroom and toilet clean, removing lime-scale and cleaning sanitary wares, vanities, tub, shower, and taps. We clean kitchen appliances, such as ovens, freezers, washing machines, polish countertops, hoover and mop floors and go to the back of every cupboard. The day and time of your Ealing tenancy cleaning is entirely up to you. We are available on short notice, even on weekends and Bank Holidays. The service is not charged by the hour, which means we will stay for as long as needed to make sure your move-out report will come out perfect. We have discounts when you order any two or more of our services at the same time — you can get a significant discount from our carpet cleaning and if there are any old furniture items or appliances you would like to get rid of, you can order rubbish collection along with your move out cleaning. The move-out cleaning we carry out comes with a 72-hour guarantee, so if something hasn’t been up to standard, we will come and do a free re-clean of problem areas. Call us 24/7 for a quote on your move-out cleaning service. You can reach us at 020 7846 0213 or online — we have a booking form and a live chat feature you can use any time of the day and night. Simply tell us the time of your move-out report and the kind of property you need cleaned and we will provide you with your personal quote.